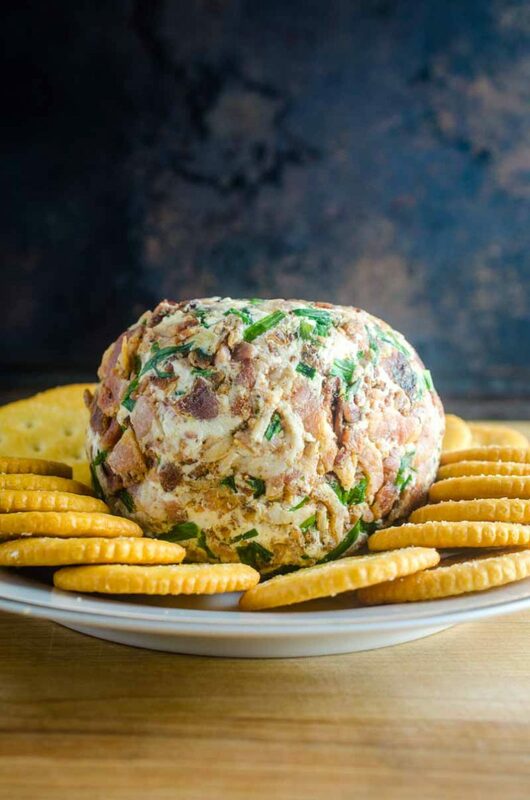 This Roasted Garlic Cheese Ball is a party must have. 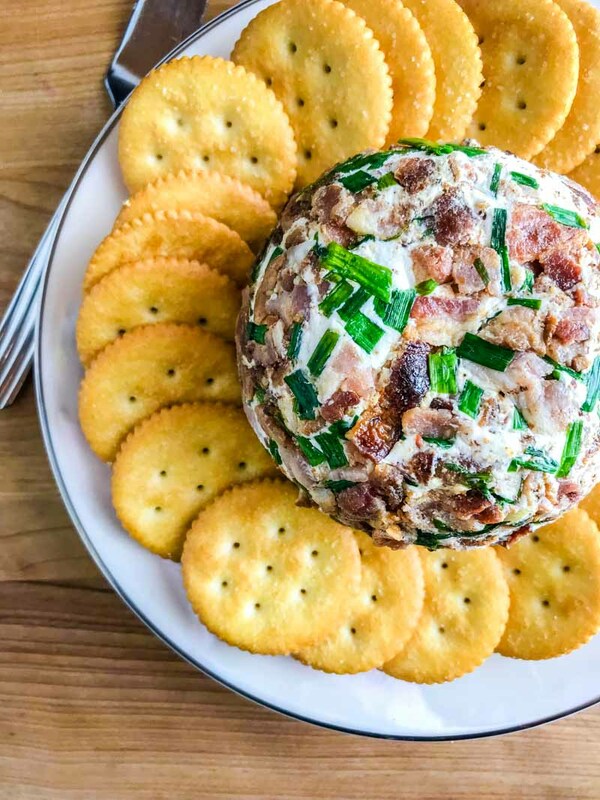 With Roasted Garlic, Bacon, Goat Cheese and Chives, this Easy Cheese Ball Recipe will be a favorite for years to come! How is your holiday party planning going? Got your menu planned for the big day? Need a couple more recipes? I’ve got one more must have for your holiday party menu. 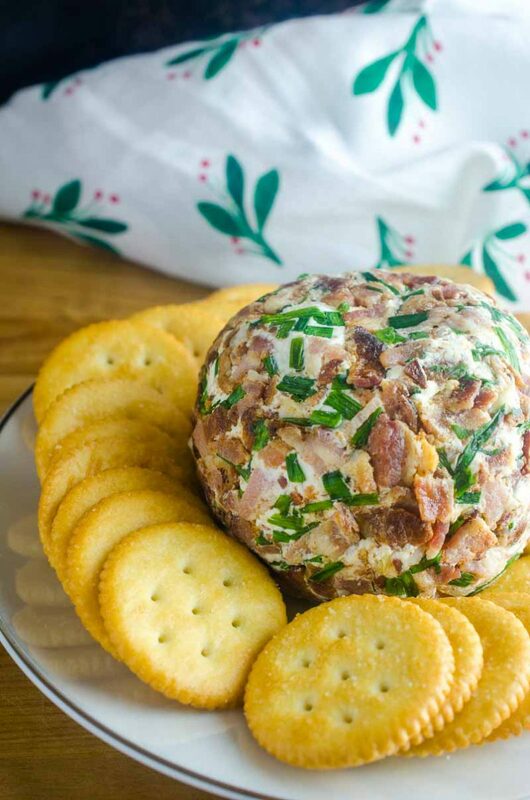 This Roasted Garlic Cheese Ball is delicious, easy to make and pretty festive too! How do you make a cheese ball? Cheese balls are actually really easy to make. You will want to start with softened cream cheese and then add whatever mix-ins and coatings that you want. Many times you’ll see different cheeses like cheddar and pepper jack. Coatings will often include herbs, more shredded cheese and nuts. 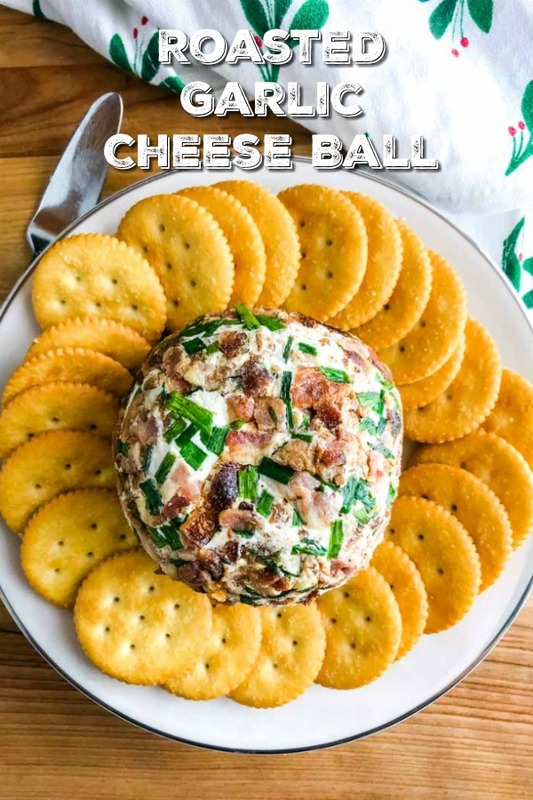 In the case of this Roasted Garlic Cheese Ball, I mixed softened cream cheese with goat cheese and roasted garlic. To coat the outside I used chopped bacon and chives. It’s basically a flavor explosion if I’m being completely honest. The trick with making cheese ball is that the cheese needs to be softened to roll it, but then it needs to be firmed up in the refrigerator. I think that makes it easier because you can make this a day ahead and then just take it out 20 minutes before serving so the cheese is easier to spread. 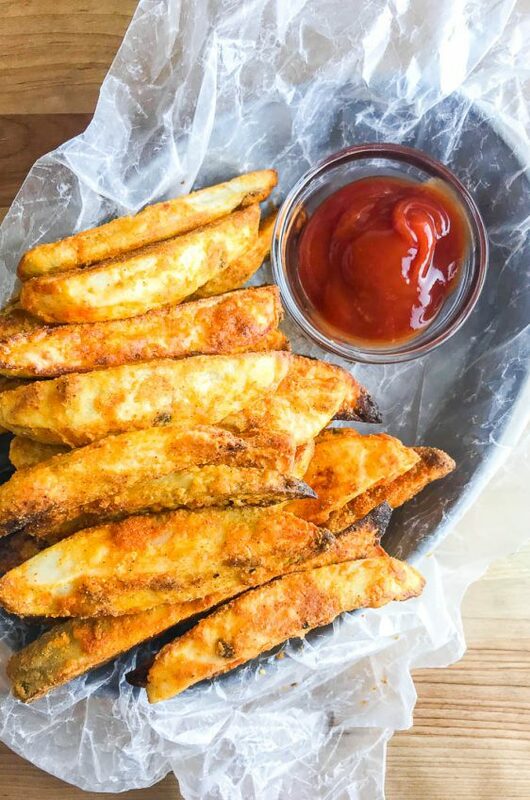 For this recipe you’ll need roasted garlic which is actually really easy to make at home. I use it in so many recipes on the blog like this Roasted Garlic & Thyme Mac N’ Cheese and Roasted Garlic & Brie Pull Apart Bread. When I roasted garlic, I cut the top 1/4 inch or so off the top of and entire head of garlic. This exposes the individual cloves underneath. Then I drizzle it with olive oil and sprinkle with salt. Finally, I wrap the garlic in aluminum foil and roast it at 400 degrees for about 40 minutes. Depending on the size of the head of garlic, some will take more time and some will take less time. I start paying close attention to it around 30 minutes. Once the garlic is soft and has browned, it’s ready to use in all the recipes. Recipes like Roasted Garlic Fettuccine and Roasted Garlic and Chicken Chowder. What do you serve with a cheese ball? Personally, I think crackers are the best. Buttery ritz are always a fave. Other great options to serve along side are crostini and veggies. 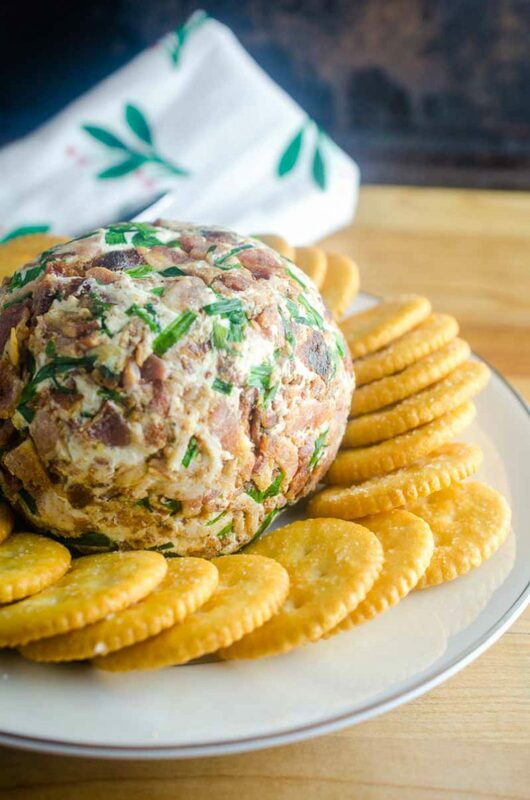 How do you make a cheese ball bite? 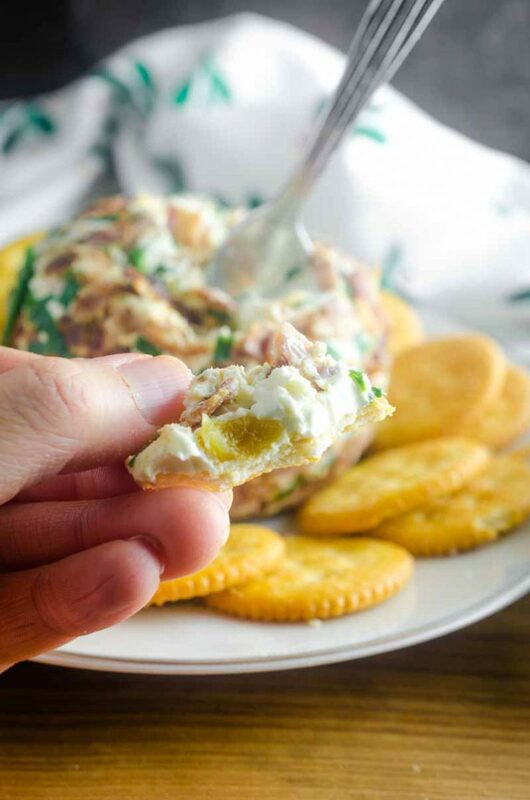 For a fun variation, you could totally turn this easy cheese ball recipe into cheese ball bites. 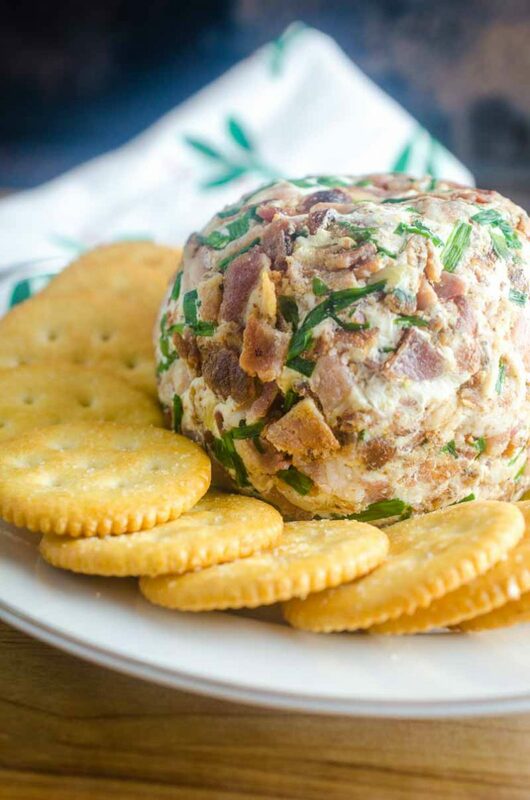 Simply roll a heaping tablespoon of the cheese ball into the bacon and chives and chill. Easy peasy done. Note: This post was originally published in 2014. Photos updated 2018. Cut the top 1/4 inch off the garlic, place garlic on a piece of aluminum foil. Drizzle with olive oil, sprinkle lightly with salt, wrap in aluminum foil and cook for 40 - 45 minutes or until cloves are browned and soft. Remove from oven and allow to cool slightly before using a fork to remove each clove. While garlic is cooking, cook bacon over medium heat until browned and cooked through. Transfer to a paper towel lined plate. Once cool, chop into bits. 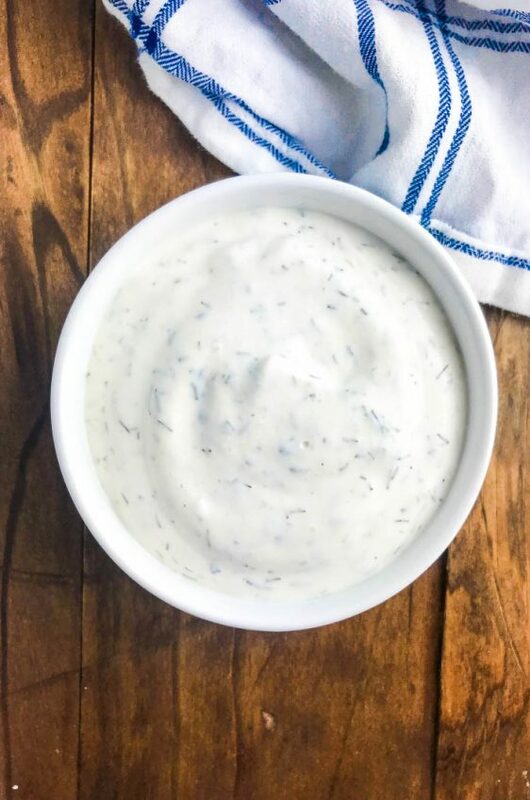 In a bowl combine garlic, cream cheese and goat cheese. Roll into a ball. Mix bacon bits and chives together in a pie dish. 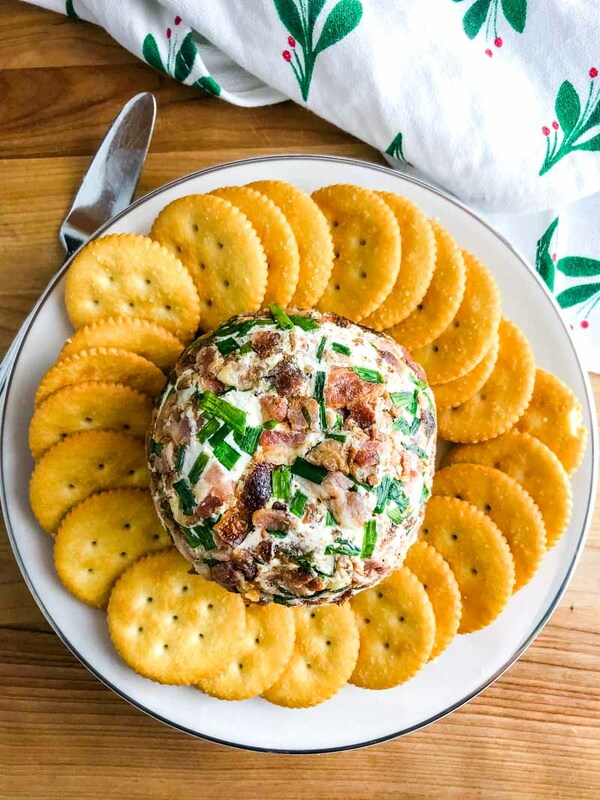 Roll cheese ball into bacon to coat completely. Wrap in plastic wrap and freeze for 15 minutes or just until firm. Refrigerate for at least 4 hours or overnight. Remove from refrigerator 20 minutes prior to serving. Serve with crackers. I am ALL about this. I might not even share! This cheese ball needs to happen! I love this idea for New Year party! This looks so good! I mean, all that cheese and all that garlic, what’s not to love!!!! And photography, it’s awesome! I love that you can make this ahead of time. With all the last minute things to do for a party, it’s nice to have this done and ready. 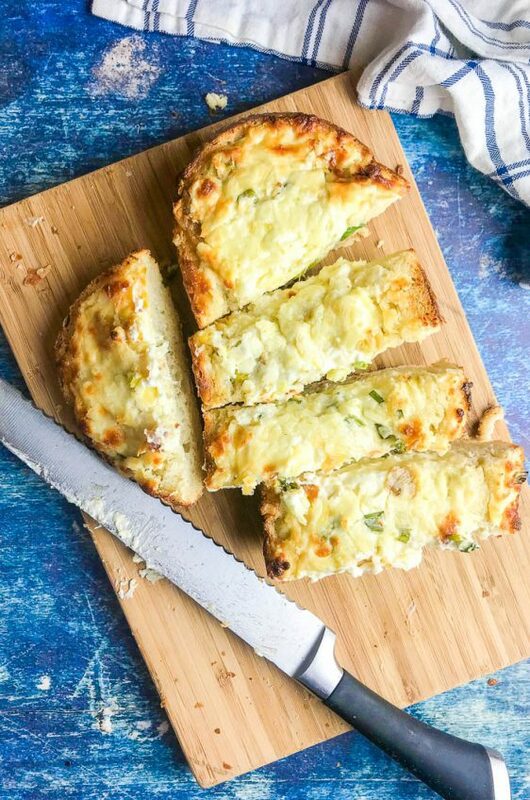 Roasted garlic adds such an amazing flavor to this! Definitely a party must have! Perfect for a little pre-Thanksgiving meal treat!